It's time for another challenge over at 613 Avenue Create! This week is a sad one for me, as this will be my last time posting with the 613 Crew. I've been a resident designer with 613 for 2-1/2 years now. I've come to think of Kathi and Chana as dear friends, and I have found myself completely inspired by the other designers on the team. They are an incredible group of crafters, and if you don't already regularly visit them, I highly encourage you to do so. This week, the Anything Goes challenge includes the OPTIONAL twist to incorporate the sights, tastes, and sounds of summer into your project. 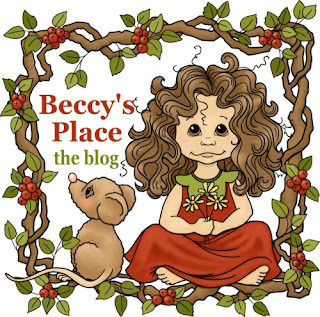 Our sponsor for the week is Beccy's Place, and I'm using the lovely image "Raspberry House". For me, raspberries are always going to mean summertime. I grew up where raspberries were THE "THING". We had bushes in my grandparent's garden, behind our houses, and I remember my grandma knocking on my bedroom window when the sun came up, to have my sister and I come help pick raspberries. We probably ate as many as went into our buckets, but we still had plenty for jams, and to eat with a sprinkling of sugar and some cream. Those are happy memories. It's no wonder that when we were doing a "summer challenge", I chose this image to work with! I water colored the bird house and raspberries with Distress Markers. I wanted the bird house to be quite soft, so that the raspberries would pop against it. I used some ribbon from my stash, along with a butterfly charm that I've had for some time (My apologies, I don't know the brand of either). I chose to leave the sentiment off of this card, but I'll likely use it as a thinking of you card. Thanks for stopping by! I hope you take a moment to visit the ladies at 613 Avenue Create to be inspired, and join in the challenge. Absolutely beautifully done Sara! Your very soft coloring style here worked perfectly to make the eye follow those raspberries! The overall vintage look is perfect for this image. Well done! This card is so pretty, Sara. Your water coloring is just awesome, and I love all the pretty details. Oh Sara, we will miss you and your amazing talent at 613! Love this last card, so soft and beautiful!! !